Inference is a global leader in the delivery of cloud-based voice automation and IVR technology. Their flagship platform, Inference Studio allows you to rapidly deploy IVR and speech recognition solutions, without investment in expensive infrastructure or software development capability. Inference Studio is an easy to use, browser-driven interface, used to quickly build solutions from simple inbound DTMF IVR to complex pre-routing and outbound services using speech recognition text-to-speech and biometrics. Traditional IVR systems are expensive and complex to implement. Inference delivers a wide range of pre-built voice automation templates designed for many common business applications that can be used standalone or in combination to provide an end to end automation solution. Whether you are a contact center, using a call recording platform, engaging in audio or video conferencing or simply on the phone as a key part of your business, the single most important part of any conversation is what’s said. Speech is, and is likely to remain, the dominant way customers choose to interact when they want results. Today with the combined improvements to accuracy, turnaround time and cost, speech transcription and analytics is readily available for businesses of any size. Predictive analytics leverages machine learning to identify patterns in voice recordings, intuit a speaker’s intent, and predict a future outcome such as a sale or churn. The transcription system returns a fully time aligned, highly accurate transcript in TXT, WORD, RTF or SRT format. Our interactive plugin provides for easy click–n-play navigation and editing. Automatically receive the confidence score for each transcribed word for accuracy monitoring and threshold setting. 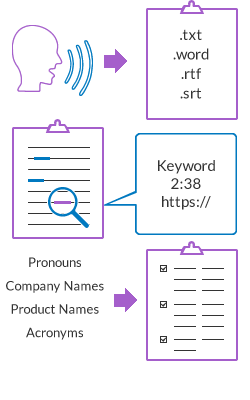 And Add unique words such as pronouns, company & product names or acronyms to your custom vocabulary to improve transcription accuracy and keyword spotting.